Five ways to ensure the fish you eat is healthy for you and for the environment. We hear a lot about what's wrong with the seafood industry these days. Our oceans are polluted and acidifying, affecting fish in ways that we're still learning about. Thanks to the prevalence of overfishing, one-third of global fish populations are overexploited and dangerously depleted. 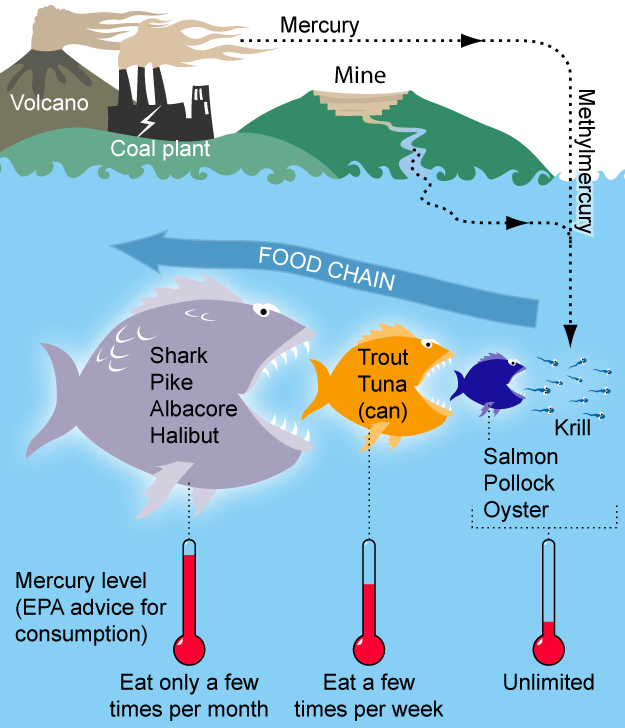 Meanwhile, mercury levels in fish are extremely high—and getting higher—due in large part to all the coal we burn. But there’s good news, too. As the sustainable-food movement flourishes, consumers are developing a keener awareness of the fish they eat and demanding more information about its origins—and its hazards. Here are six important things to consider when shopping for seafood. Mercury is a dangerous neurotoxin that can disrupt brain function and harm the nervous system. It’s especially threatening to pregnant women and young children. As a general rule, smaller fish—think squid, scallops, sardines—contain less mercury than larger varieties like tuna and swordfish, which are higher up the food chain. Why's that? Because when bigger fish eat smaller ones, the predators also absorb their prey's contamination in a process known as biomagnification. So when a tuna eats a bunch of anchovies, the tuna is accumulating the mercury of those anchovies into its own body. This handy chart helps you figure out which fish are safer to eat than others when it comes to avoiding mercury. Note: The data for this guide to mercury in fish comes from two federal agencies: the U.S. Food and Drug Administration, which tests fish for mercury, and the U.S. Environmental Protection Agency, which determines mercury levels that it considers safe for women of childbearing age. View the equations we used to make these serving recommendations. People in the United States consume close to five billion pounds of seafood every year, and 90 percent of it comes from countries that lack rigorous management laws, like China and Vietnam. Increasingly, the seafood we import isn’t wild-caught but farm-raised overseas, often in factory farm–like conditions where the fish are exposed to dangerous antibiotics and chemicals (many of which are banned in the United States), stored in bacteria-laden ice, and even fed pig feces tainted with Salmonella. The clincher? The U.S. Food and Drug Administration only inspects about 2 percent of all seafood that comes from abroad. Better to stick with what's caught closer to home. However, while U.S. fisheries have made significant progress toward ending overfishing and rebuilding depleted populations under federal fisheries law, some fish (such as Atlantic cod) are still in trouble. To make sure you're buying fish that are caught sustainably, use this simple app by Monterey Bay Aquarium's Seafood Watch (more below). Year after year, Americans opt predominantly for the same five types of seafood: shrimp, salmon, canned tuna, tilapia, and pollock. Each comes with its own set of concerns, but high demand can lead to overfishing, harmful catch methods, habitat destruction, and overuse of antibiotics. Meanwhile, the protected ocean waters along the U.S. coasts are teeming with hundreds of delicious and sustainable fish species like mullet and scup. By choosing to eat these underappreciated species—sometimes referred to as “trash fish”—we can minimize damage and help U.S. fisheries continue to rebound. You’ve heard of farm to fork, but what about boat to fork? Community-supported fisheries, modeled on community-supported agriculture programs, where customers pay to receive a regular share of a farmer’s harvest, are growing in popularity. Joining a community-supported fishery is an excellent way to know exactly where your fish comes from, who caught it, and how. (Small-scale, sustainable fishermen often employ lower-impact catch methods like hook and line, or laying pots and traps). These programs help bolster regional fishing economies while increasing demand for local, sustainable seafood. Visit localcatch.org to find a CSF in your area. If you can't join a CSF, buy your seafood from trusted retailers and restaurants. Certain businesses have set higher standards for the seafood they sell in their stores, and many have pledged to create long-term sustainable seafood plans. By simply asking if a store or restaurant offers sustainable seafood, you can help shape demand for fish that has been caught or farmed in environmentally responsible ways. This video from Monterey Bay Aquarium’s Seafood Watch program highlights why such questions are important. Some seafood comes with helpful labels that take the guesswork out of buying sustainably. You can learn about the various certification programs and which labels to watch for when shopping for seafood. The Marine Stewardship Council, for example, is one of the leading certification and labeling programs in the world. Although these rules of thumb can be helpful, choosing seafood that is both healthy and sustainable can be tricky. Thankfully, there are tools to help you make smart seafood choices more easily. Monterey Bay Aquarium’s Seafood Watch uses a rigorous, science-based process to grade seafood choices as “best choices,” “good alternatives,” or seafood to “avoid.” Checking this guide or downloading the app before heading to the grocery store or ordering from a restaurant is the smartest way to decide which fishing practices you want your dollars to support. Whether you're getting dental fillings or ordering sushi, keep these tips in mind to avoid exposure. To make sure that that kale is good for you and the environment, you should really get to know it better. Colonel Sanders, We Salute You! KFC will eliminate medically important antibiotics in its U.S. chicken supply chain by the end of 2018. How to decode all those labels, find responsible producers, and help force change in the beef-production industry through the power of your dollars. Fish farms boost the risks of sea lice infestations, chemicals in the water, and accidental spills that leave native fish floundering.